Dave Domenichini, owner of D.R. 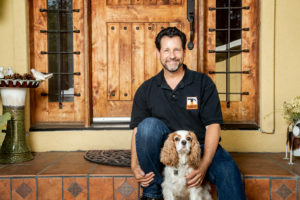 Domenichini Construction, and his dog Charlie in their San Martin home. Dave Domenichini turned his “hobby” into his dream career. The now 55-year-old was nearing a decade working in outside sales for an asphalt and concrete company when one Friday in 2004 the owner announced his pending retirement. Domenichini immediately drove home and filled out and sent in the forms to get his contractor’s license. When he returned to work Monday, the owner’s nephew said he would reorganize the company and Domenichini was able to keep his job. After getting his contractor’s license, he did both jobs for five years. Eventually, the contractor side job was doing so well that he quit the asphalt company to concentrate on building his own business. “My hobby has turned into my profession,” said Domenichini who employs 12 people out of his San Martin-based business. Born and raised in San Jose, Domenichini moved to San Martin in 2007 two years after marrying Gina Varela. His firm, D.R. Domenichini Construction, was selected this year by Remodeling magazine to join the Remodeling Big50. Each year since 1986, the Remodeling Big50 inducts 50 remodeling companies that have set exceptionally high standards for professionalism and integrity through exemplary business practices, craftsmanship, and impact in their community or the industry at large. Dave Domenichini, owner of D.R. 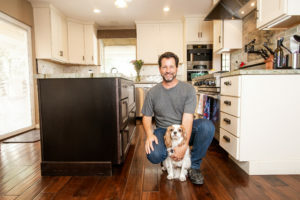 Domenichini Construction, and his dog Charlie in their San Martin kitchen. To get a sense of how unique this status is, consider there are roughly 98,000 remodeling firms in America with paid staff, said Craig Webb, editor in chief of Remodeling magazine. “Since 1986, only about 1,600 firms have been selected, just 1.6 percent of all the remodeling businesses in the country,” he said. To the remodeling industry, being part of the Big 50 is a stellar honor much like the Hall of Fame is to a talented pro athlete. Companies fortunate enough to be part of the prestigious Big50 run successful, often growing, companies of various sizes that have taken the lead in raising industry standards. D.R. Domenichini has also received several accolades this year including three categories in Home Builder Digest’s Best of Silicon Valley and more locally, the Best General Contractor and Kitchen and Bathroom Remodeler in Morgan Hill for 2018. “We are truly humbled to receive this national recognition and feel privileged to be named to this select group of remodelers,” Domenichini said. Being ranked in the top 2 percent of all remodeling companies in the United States starts and ends with customer service. He has anywhere from eight to 10 jobs going at any one time. One task he implemented to ensure consistency and good service was to require all project managers send out a formatted progress report nightly for each project they manage. “The note includes a short description of what the team accomplished that day, what the project manager’s homework is, what the client’s homework is, and any change orders,” he said. Each manager typically oversees one to four projects at any one time and sends out the note before 6 p.m. The company’s constant and up-to-date communication continually impresses customers. It also pops up in nearly every review the company receives. In addition, the nightly email updates are all in one email chain (with Domenichini copied on each one) so that there is a record of everything done on the project. Domenichini, and his team enjoy watching his clients’ visions come to fruition. Most of those are kitchen and bath remodels but he will do complete home remodels.